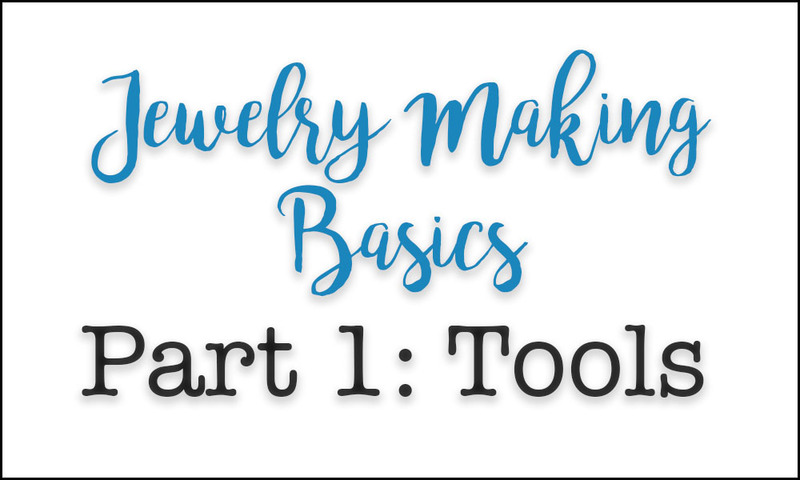 Making jewelry is a hobby that anyone can pick up easily. I did. Over 15 years ago, after seeing a necklace a friend made, I dove right into the craft. With much practice, many years, and lots of trial and error, I think I finally have it. And, I want to share what I know and how I do it. As such, I'm working on creating a series of tutorials, videos, and information to spread the joy of creating as best as I know how. 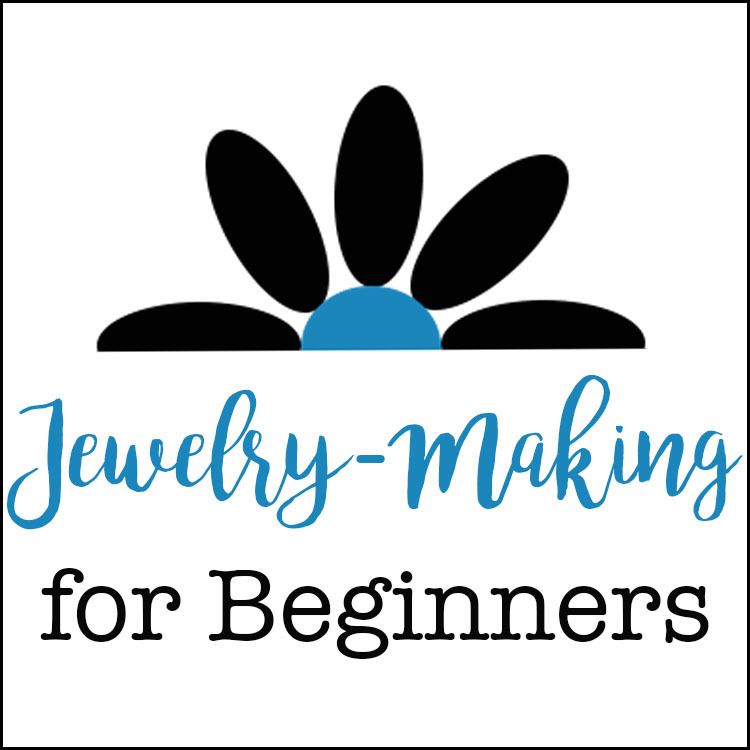 This is the first in that series that will consist of videos on my CraftyHope YouTube Channel and additional information and pictures here on the blog. This series begins with basic information on the tools, materials, supplies, and whatnot needed to get started. Today's lesson is on tools. For the most part, this covers pliers. Let me start by saying that it's not necessary to go out and buy the most expensive pliers you can find. I’m still working with many of the inexpensive ones I got many, many years ago. Of course, if you’d rather work with the best you can find, go for it. Alas, I don’t have any recommendations on brands. Buying a kit is a great way to start. They often have the basics covered. As a note - I have seen sets of tiny pliers. While these are super cute, I would not recommend getting those as you start out, unless you have really tiny hands. Getting something that fits your hands as comfortably as possible will make using them less tiresome and more enjoyable. 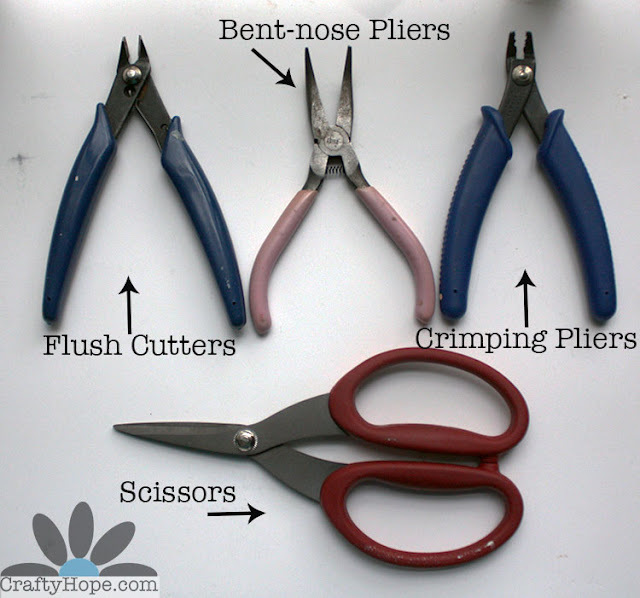 In my opinion, there are three main pliers you should have to begin your jewelry-making journey. Wire cutters: As they are named, these are used for cutting wire. Keep in mind that thicker, heavier gauged wires will require more heavy-duty cutters. You can seriously damage and dull your cutters if you try to cut something too heavy. I’ve made due in a pinch with nail-clippers for some wire. Wire cutters come in a variety of shapes, sizes, grips, weights, and uses. Please note that memory wire is some of the toughest stuff on earth and will require more heavy-duty or specialty cutters. Chain-nose pliers: These long, skinny nosed pliers are a main staple of jewelry-making. The flat inner surface of chain-nose pliers is great for holding things stable while working with them. They are great for opening and closing jump rings, holding loops while wire-wrapping, holding and maneuvering small findings that might be too fiddly for fingertips, and many more tasks. Take a look at the jaws of yours. Some have ‘teeth’ on them while others are flat. Ones with teeth can scratch and mar the surface of your metal but can also give you better hold and control. Weigh your options and pick what’s best for you. Round-nose pliers: Used to help create loops in wire with their round shape, the tips of these are small and get larger as you move toward the handles. This design gives you options as to the size of the loops you make. When starting out, it might be a good idea to make several marks on your round-nose pliers with a permanent marker or nail polish to indicate specific sizes. This will help you be more consistent in the size of your loop-making. Round nose pliers can also be used to open and close jump rings and hold/maneuver small parts. However, their rounded surface doesn’t make them ideal for these purposes. I will say that there is some discussion about the shape of the pliers when they are closed. I like to have as little space between the jaws as possible when they are closed. That way, I know that any wire (even the tiniest gauge) can be held securely. Other designers don’t really care. It’s a personal preference for sure. There are a few other tools that can be added to this list of the basics. Flush cutters: These are a type of wire cutters. They’re great for cutting flush against a surface, hence their name. The small tip on flush cutters help them get into some of the tightest spaces. Bent-nose pliers: As you can see, the tips of these are bent, hence the name. Apparently, these pliers were initially developed for electricians to use much like tweezers. While I can see the importance of that, I personally just use bent-nose pliers by holding them in my left hand (with my chain-nose pliers in my right) to open and close jump rings and loops as well as to hold and manipulate objects. Crimping pliers: These are used to securely smash crimp beads and tubes closed on beading wire. They are not completely necessary as a pair of chain-nose pliers can also get the job done. However, crimping pliers are designed specifically for this purpose and do work more effectively than the chain-nose pliers. I’ll share in a later post/video how to use them. Scissors: An obvious tool in any creative person's stash, scissors cut objects. They are used specifically in jewelry-making to cut materials such as thread, fiber, leather, cord, etc. There are a variety of other types of pliers and tools you could add to this list. I know I personally have lots more. However, for a beginner these are a great starting point. As mentioned above, you could get by simply with the first three on the list. If you have any questions, corrections, additions, or whatnot; please feel free to let me know. Also, comment if there's something specific you want to learn so I can make sure to include it in the series. Linking up at Talk of the Town and Think Tank Thursday at Saving4Six. 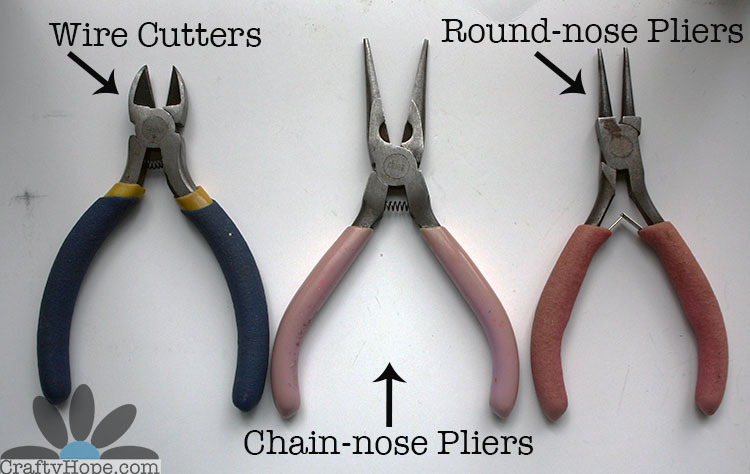 This information is very useful for beginners, I know it because I was once and started with the three types of pliers pictured first :) This is a good round-up and I really needed someone to tell me the difference between flat and chain nose pliers back then. I still use most of the tools I got from the hardware store 6 years ago but I have also invested in specific tools like flush cutters, crimping pliers and nylon jaw pliers.